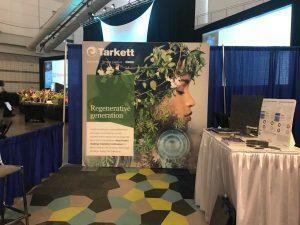 ASL VP of Business Development, Courtney Sunna, attended the Living Product Expo in Pittsburgh in September 12-13 2018. The conference focused on various aspects of products development around carbon emission, climate change, sustainability, energy efficiency, healthier materials and certifications. 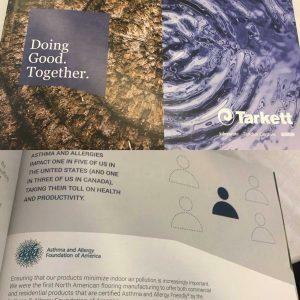 Some of the manufacturers that have joined our asthma & allergy friendly® Certification Program presented their healthier products at the conference such as Tarkett and Owens Corning. These companies shared their knowledge and insights on their initiative to develop healthier products and the reason why they choose to innovate and invest in making their products healthier for their customers. 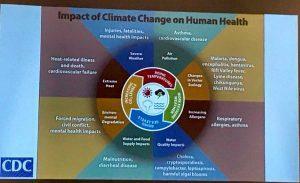 The Expo also revealed some very interesting data and insights on the impact of climate change on human health. A great infographic listed the 4 different aspects that climate change will change on the planet – Rising temperatures, Increasing CO2 levels, More extreme weather and Rising sea levels – and how these will impact our direct environment as well as our health. Several direct consequences of the climate change on the environment such as air pollution and increasing levels of allergens are shown to have a direct negative impact on humans health and in particular on asthma and respiratory allergies. This aspect reinforces the importance of keeping in mind consumers’ health when developing new products as this will become an urging issue but also the way sustainability and health are closely intertwined. 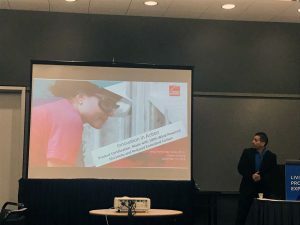 As Owens Corning’s Senior R&D Leader in Product Sustainability & Stewardship, Jesus Hernandez-Torez, explained, it is fundamental for manufacturers to take into consideration the carbon-foot print and the impact of building products on the planet when developing new products and to focus on “Climate positive building products”.